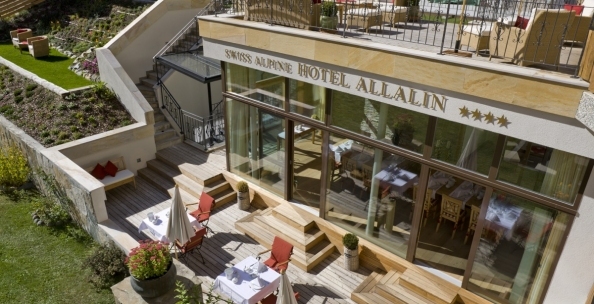 The Swiss Alpine Hotel Allalin right in the center of Zermatt, halfway between the station and the cable car, offers free shuttle service between the train station and the hotel (7:30 a.m. – 6:30 p.m.). Wood carvings can be found throughout the entire Allalin hotel and provide for a very special, alpine atmosphere. All rates include a rich buffet breakfast and a refreshing drink in the afternoon. The charming rooms with balconies are either facing south towards the Matterhorn mountain or towards the village and the Mischabel mountain range. Wireless internet is available in the entire Allalin hotel free of charge.